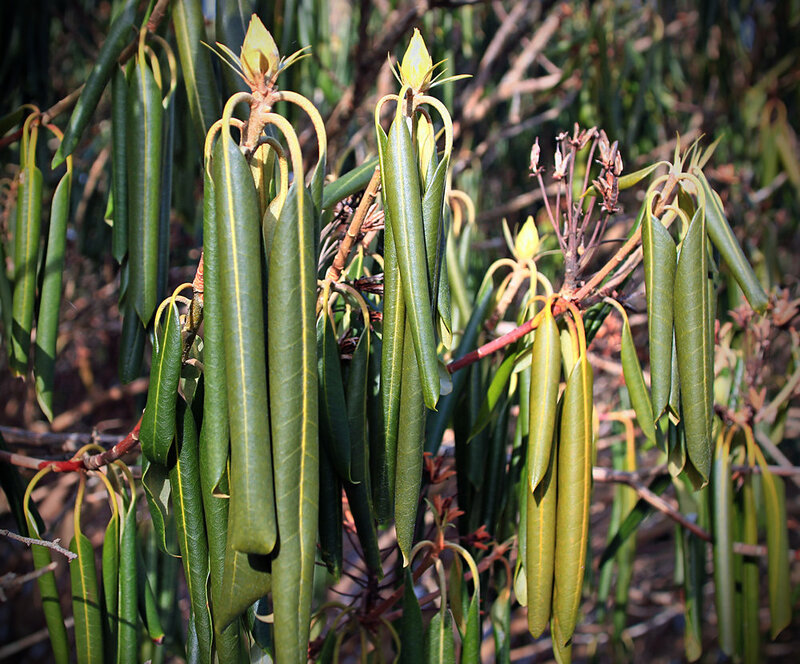 Why Do Rhododendron Leaves Droop and Curl in the Winter? Broad leaved, evergreen plants living in the temperate regions of the world face quite a challenge come winter time. Freezing temperatures, lack of water, and often intense sun can exact quite a toll on living tissues. These are likely just some of the reasons why, relatively speaking, broad leaved evergreens are a rare occurrence in temperate zones. By far the most popular group of plants in this category are the Rhododendrons. Many a Rhodo lover has said that they can tell how cold it is outside by looking at Rhododendron leaves. Indeed, as temperatures drop, the leaves of these evergreen shrubs frequently droop and curl up like green cigars. These leaf movements do seem to be tied to the weather but their triggers and function have been the source of a lot of debate. Certainly not all Rhododendrons are cold hardy but those that are seem to benefit from reorienting their leaves. Why does this happen? In the past it has been suggested that leaf reorientation may have something to do with reducing snow load. If the leaves were to remain horizontal, this could cause enough snow buildup to break branches. The fact that a considerable amount of ice and snow can accumulate on branches regardless of leaf position, and largely without harm, seems to suggest that this is not the case. Others have suggested that it could be a way to reduce water loss. As the leaves droop and curl, they are hypothetically increasing the humidity around their leaves and thus reducing their chances of desiccation. This seems pretty far fetched for a few reasons. For starters, Rhododendron simply do not open their stomata during the colder months. By keeping them closed, there is no net transfer of water into or out of the leaves. Also, their thick, waxy cuticle keeps water within the leaves from evaporating out as well. Finally, leaf drooping and curling happens long before the ground freezes and therefore doesn't seem to be triggered by a lack of water in the environment. The leading theories on this phenomenon seem to deal more with issues at the cellular level. The first of these has to do with the sensitive photosynthetic machinery inside the chloroplasts. Leaf drooping may actually be a response to increased light. Though we generally don't think about photosynthesis in the winter months, evergreen plants actually experience the highest light intensities of the year during this time period. 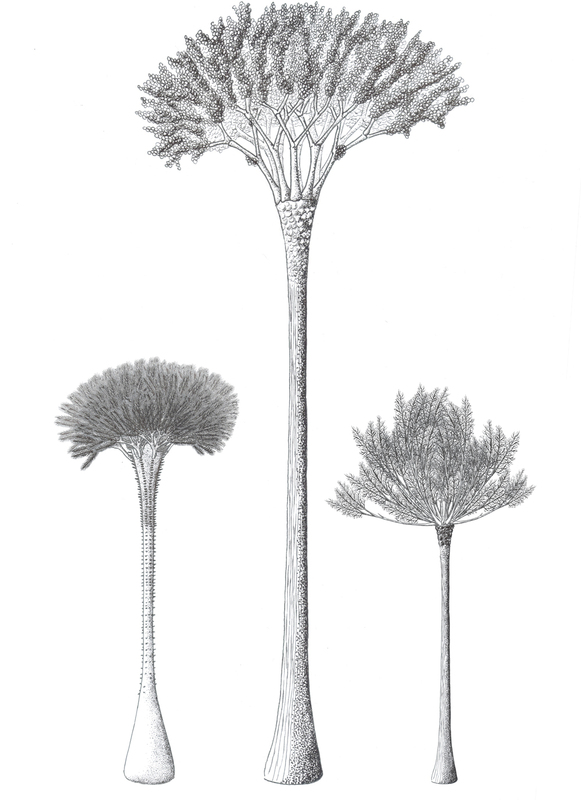 Throughout the growing season, they are generally shaded by the overstory. However, once the canopy leaves fall, things change. Because the plants are, for the most part dormant, the photosystems within the chloroplasts have no way of dissipating the energy from the incoming sunlight. Photosystem II is especially vulnerable under such scenarios. Experiments have shown that leaves that were forced to stay horizontal during the winter experienced permanent sun damage and photosynthesized considerably less than leaves that were allowed to droop once favorable temperatures returned. The thought is that by positioning the leaves vertically, the plants are reducing the amount of direct light hitting them throughout winter and therefore reducing the potential for light damage. These experiments also revealed something else about the changes in leaf position when it comes to shape. As it turns out, curling made no difference in protecting the leaves from light damage. It would seem that drooping and curling are responses to two different types of environmental stress. So, why do the leaves curl? The answer to this question is physical and one that has gained a lot of research attention in the field of cryogenics. When living tissues freeze, ice crystals build up to the point that they can rupture cell membranes. This is only exacerbated if the tissues thaw out quickly. Anyone that has ever tried to freeze and then thaw leafy vegetables knows what I am talking about. To best preserve tissues via freezing, they must freeze quickly, which reduces the size of the ice crystals that can form, and then thaw out slowly. 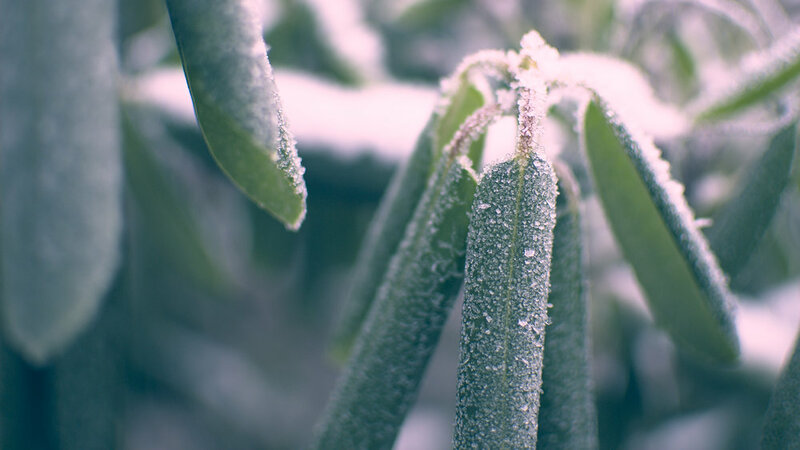 Researchers found that Rhododendron leaves freeze completely at temperatures below -8 degrees Celsius (17.6 degrees Fahrenheit), temperatures that occur regularly throughout the range of temperate Rhodo species. Again, experiments were able to demonstrate that flat leaves thaw much more rapidly than curled leaves. This is because a curled leaf exposes far less surface area to the warming sun than does a flat leaf. As such, curled leaves don't thaw out as fast and thus are able to avoid much of the damaging effects of daily freeze-thaw cycles. Though these are all components of the Rhodo leaf puzzle, there is still much work to be done. What we do know is that leaf drooping and leaf curling are two separate behaviors responding to different environmental pressures. Indeed, it appears that these two traits seem to be tied to cold hardiness in the genus Rhododendron. What the exact triggers are and how they produce the changes in shape and orientation, as well as the mechanics of winter survival at the cellular level are topics that are going to require further study. Until then, I think its safe to say that we can appreciate and, to some degree, rely on the spot forecasting abilities of these wonderful shrubs.